We are celebrating Parmigiano Reggiano this month with another recipe from the Biltmore Culinary Academy. This time we are sharing a unique twist on the familiar dessert—the flan—except it is not what you think. Taking on a more savory approach, we are using grated cheese, chorizo, wild mushroom and tomato ragu. 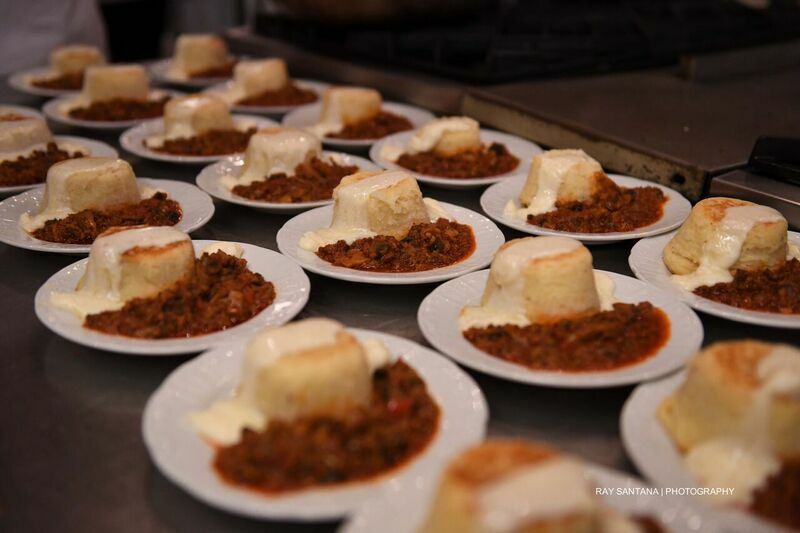 The potato flan will be plated with a side of the picadillo-style ragu. This is a great portion to serve to your friends and family when hosting them over the holidays. It offers a great balance between the fluffiness of the flan “cake” and the sauciness from the tomato. Let’s begin with the flan. Here is what you will need. In a large saucepan, boil the peeled and cut potatoes over high heat until tender, approx. 15 minutes; strain and let stand to air dry slightly. Place the potatoes back into the large saucepan and mash them up, add the butter, eggs and parmesan cheese. Season with salt, pepper and nutmeg to taste. Butter 24 aluminum ramekins and pour the mix to bake for 15-20 minutes until golden on top. Cut the fontina cheese into small pieces. In a small nonstick pan, cook the fontina and the fresh cream over gentle heat until the cheese melts completely. Let rest in the refrigerator until its consistency gets harder. Let rest for 5 minutes before serving. Scoop the fontina mixture into a piping bag and pipe a wisp of the cheese cream on top of each flan. For the ragu, here is what you will need. Then for all the savory goods, do this. In a medium saucepan over medium heat, cook the chorizo until done; add onions and allow them to cook until translucent. Add all the mushrooms and continue to cook until the mushrooms are tender and all the liquid is evaporated. Add flour and allow it to cook for about 8 to 10 minutes. After the flour has cooked, add the tomatoes and chicken stock and all the ragu to simmer for 15 minutes on low heat. Once all is said and done, you are ready to put it all together. Take out your small serving plates and place the flan off to one side. You can be as plentiful as you’d like with the ragu. Pour a scoop of it on the side or let some of it drip over your potato flan. Just be mindful that the chorizo might weigh down on it. Your friends and family will definitely enjoy this savory flan any time of year. Looks awesome! Making the potato flan tonight for Xmas Eve dinner, but with a braised beef dish. Noticed there’s no recommended temperature for the potatoes, but looking at other potato flan recipes, seems like 400° will work.